Our recent European holiday ended with a week long stay in Sliema which is just over the water from Valetta in Malta . The picture attached was taken at dusk and show the harbour entrance. Malta is indeed a very nice place and the capital abounds with history. Our first night in England the owner of our B&B suggested this pub up the road. The Lydden Bell is a delightful country pub in the Kent countryside. We had just arrived from Adelaide via Doha with about 26 of travel time. My heart’s desire was an English pub meal. Local beer cod and chips what more could you ask for. Lovely whitebait for entree. The only disappointment was an Eton Mess for dessert which really was a tasteless mess. Three pints of local ale i forgot the name A lovely sunny evening then it was a quick cab ride to our accommodation Crabble Hill Guest House and then off to bed. A beautiful spot in the Pacific with something of a tragic past. This island is part of the Loyalty Islands which are part of the French territory of New Caledonia. We were there om 15th July 2016 as you can see by the photo it was a glorious day. 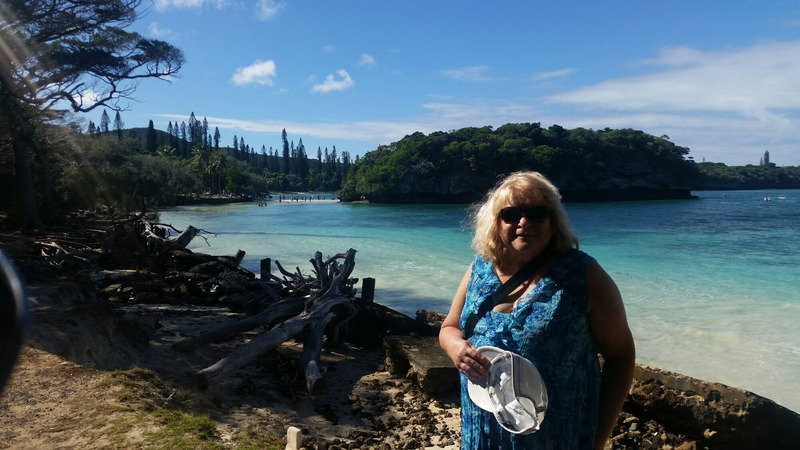 Today the Isle of Pines is about pristine waters snorkeling and tourism. We arrived on a cruise ship which anchored of the coast and we’re ferried in on the ship’s lifeboats. The locals were friendly and didn’t really tout for business making for a relaxed day on the beach. The history of the Isle of Pines is darker. It was a French penal colony from 1872 until 1913. Besides criminals there were also political prisoners banished to the Isle of Pines. These political prisoners were from the Paris Commune. I have linked to the Wikipedia article on this period of French History. According to plaques near the ruins of the old penal colony the indigenous people the Kanaks, the link is to a Wikipedia article on theses people. In short the French annexure of these Islands did meet with resistance from the indigenous people. We have been on a 10 day road trip to Tasmania. 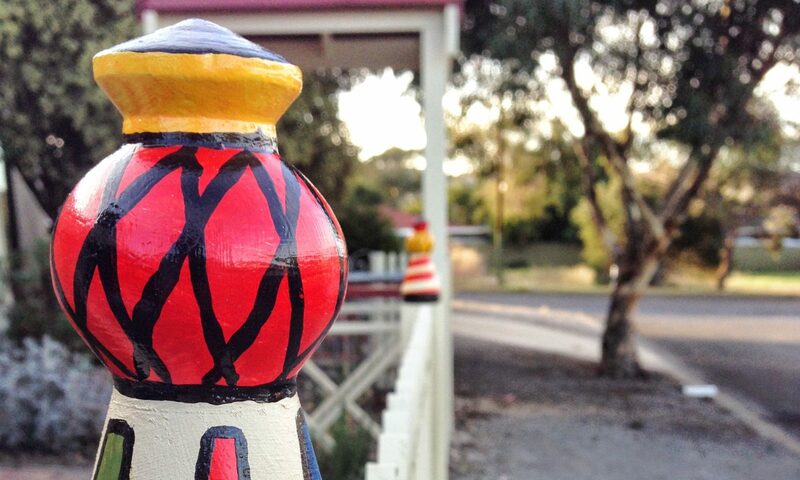 We travelled back via the Great Ocean Road which is considered to be one of the great coastal drives the world. Marselles 2013, a photo by berniesr on Flickr. We found a museum with an ancient Roman Harbour inside. I am continually amazed at how busy the Romans were and how many of their buildings and structures are still! There is of course the obligatory catholic cathedral. Somewhere different is always good but I wont be hurrying back. We are back from our epic six-week holiday in Europe. A 24 day cruise in the Mediterranean and two weeks in Croatia. I will do a series of posts with photos soonish. Here is a video to start with. We are currently in Zagreb onthe outskirts in a suburb called Strmec. Our cruise ended a week ago. We travelled by bus from Venice to Pula in Croatia. This took us briefly through Slovenia. Apprently Slovenia was given some land so that they have sea access as part of the EU deal. Our main reason for visiting Pula was to see the impressive Roman amphitheatre. Pula itself is an old town with the problems associated with these old places. Narrow streets and graffiti are what we usually see. We stayed at a fantastic hotel called the Histria (Verudela, Croatia) which has magnificent views of the mediterranean ocean. We travelled by car and explored a couple of other town in Istria Rovinj and Opatije. Both places where beautiful and not so crowded. Driving on the righthand side of the road was much less of a hassle than I thought. We are really into it now. Seven stops so far. Marseilles a rather drab city not helped by the lack of sunshine on the day. There was the obligatory cathedral with the Madonna and “kid” as described by the guide. We caught a little train for €8 a head,good value. Starbucks is everywhere but worth a visit on account of the free WiFi. Got hassled by beggar inside but nothing else. Lots of shops bought a couple of shirts and watches. Otherwise this isn’t really a tourist town. The ship ran bus tours inland for a taste of Provence we saved our money. We did find a museum featuring the remains of a first century Roman harbour. It came to light during WW 2 after sustained bombing by the Germans. Pity that it was all in French and no English translation, merde. I saw this photo on flickr. 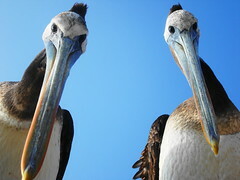 It is great I have never seen a pelican up so close; let alone two at such close quarters. I had a close encounter with a largely tame Pelican in Mykonos last year and now wish I had taken some up close and personal pics like this. They remind me of the alien birds in the old Warner Brothers cartoons from the 1950’s. Just great. I guess its just a matter of being in the right place at eh right time. Any way if you click on the photo it will take you to flickr.com and the profile of the photographer. 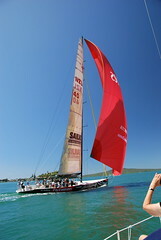 On a recent trip to New Zealand I had the good fortune to have a sail on Auckland harbour. The place we were staying offered a cruise on the harbour. We were taken out on a 34 foot sailing boat. On our return into the harbour we were confronted with one of the old Americas cup yachts. These yachts are available as cruises on the the harbour. There can be up to 30 people on them , standing room only. You can see the crowds on the deck! However under spinnaker it did make a great sight and a perfect end to my first ever sailing experience.